The quality of a civilisation’s culture is most visible in its art and more particularly in its architectural accomplishments, for these are usually its most complex and long-lasting forms. It’s hard to conceive of a more awe-inspiring architecture than that found in ancient Egypt. The essence and message of Egyptian architecture remained unaltered throughout the millennia, while its majestic and aesthetic style still manages to convey forgotten psychological and spiritual truths. The symbolism of the Egyptian temples covers many different aspects and functions. In this first article we will look at the mythological and magical aspects. In the next issue we will learn more about the different parts which constituted a temple complex and their symbolic meanings. 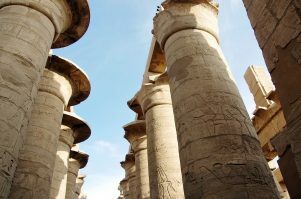 The function and purpose of the Egyptian temple is clearly reflected in the teachings found in Egyptian creation myths. These myths relate to the beginning of time when a mound of earth arose from the primeval waters. A bird (symbolising the spiritual element) rested on reeds growing on the mound which became a sacred place. The temple symbolises this ‘first moment’, with the ceiling representing the heavens, the floor symbolising the mound and the columns the reeds, lotus and papyrus. Each temple is a microcosm of the universe in which each part of its physical structure symbolises an aspect of the origins of the cosmos and the process of cosmic regeneration. Cosmic cycles of decline and rebirth were part of this temple symbolism, the main function of which was to control the hostile forces of chaos and to maintain harmony, balance and order on Earth. The temple therefore acted as a bridge between the heavenly realm (symbolising order and law) and the earthly realm (symbolising chaotic forces). The theme of creation can also be found in the Temple at Luxor. Its proportions and harmonies are symbolically related to the story of the creation of man, his development and his relationship to the universe. Laid out according to the proportions of an idealised male frame, this temple didn’t just reflect the patterns of the physical body; its architecture also revealed the occult and metaphysical anatomy of man. Man, in an archetypal sense, is not just a ‘product’ or a ‘scale model’ of the universe, he is its essential embodiment. For this reason, the Temple of Luxor, as a vast stone symbol, also encapsulates the totality of Egyptian ‘universal wisdom’: its science, mathematics, geodesy, geography, medicine, astronomy, astrology, magic, art, etc. From a magical perspective, the overall purpose of the temple was to ground associated sidereal influences on Earth. Specific temples were linked to specific star-gods. These magical correspondences were meant to favour a downward pouring of spiritual influences and a constant regeneration of human social culture. The scientific basis of this type of spiritual transmission rested on the correct use of harmonic proportions, magnetism and acoustic resonances. The temple’s architecture was specifically designed to produce its own set of psycho-magnetic effects (as in feng shui) to work upon the subconscious nature of the individual. This architectural feng shui was (and still is) believed to be directly perceived by man’s subtle nature, which also responded (consciously or unconsciously) to the whole temple geometry. In accordance with the aforementioned magical objectives, many temples were deliberately dismantled when their time came to end, and their magical action was disabled by the priests. Some were constructed and demolished according to preordained plans which probably had astrological reasons. Sometimes reliefs and inscriptions that had served their purpose were effaced and nothing new was added. For our 21st century mentality it’s quite hard to understand the magical side of Egyptian architecture, but if we consider that the Egyptians were very practical people we can perhaps appreciate their intentions better. In fact, if we study some of the later sacred architecture of the West (e.g. medieval cathedrals), we will discover many similarities in knowledge, message and intention.